The thug comes towards Guddan and the girl. Guddan fools him and runs with the girl from there. The thug says my head hurts. What did they mix in our drinks. He takes out knife. The DILs are scared. Guddan hits his head and says lets run. Guddan holds the shelter gate and asks them four to run. The thug calls Rawat and says Durga and Guddan got the girl from here. He says the time is almost over. They wont be able to save AJ. Durga is driving. Laxmi says please drive with care. Rawat stops their car. He says come out of the car. Rawat says you thought you could take her from there.. He takes out a girl from the car but it is saru. Rawat says where is vidya? Durga says where she should should be. Vudya and Guddan are on scooty. The judge says keeping all the proofs and witnesses in mind this court.. Guddan comes in with vidya on scooty. She says here is the proof of AJ’s innocnet. I know I shouldn’t have got the bike here. Judge says but the court time is over. Guddan says for few seconds you will punish an innocent man? He says no I will give you a chance. He summons Vidya in witness box. Rawat comes to the court room. Vidya says I am a voice over artist. Rawat paid me money to record that disk. He got me kidnapped and then Guddan saved me. Judge says rawat is she right? The court respectfully leaves AJ and arrests Rawat. They take his license. Everyone hugs AJ. AJ looks at Rawat. Guddan says Rawat sop. Don’t be angry. Antra would have done the same. Hate doesn’t do good to anyone. You better go away from here. Rawat says I wont come back to this city. but think.. What if he finds out you have been collecting proofs for me? Guddan says go from here. Let us live. AJ comes out. Rawat says she is asking me to leave the city. AJ says we are family. You are still. Rawat says after Antra there is nothing between us. I hope he keeps you happy Guddan. He leaves. Dadi says he has gone crazy. Guddan says in heart I should tell him truth. Everyone comes back home. Dadi says Guddan I am so proud of you. Guddan says DILs made it possible. AJ says one DIl did more than she should have. Saru says I am sorry. She says restaurant was in danger so.. AJ says its okay. Dadi says all good now. They do pooja togehter. Precap-Guddan asks AJ to her mangalsutra. He breaks her mangalsutra in anger. Guddan is dazed. 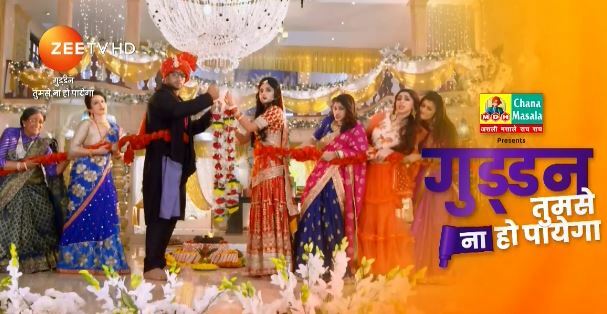 The post Guddan Tumse Na Ho Payega 5th March 2019 Written Episode Update: AJ released appeared first on Telly Updates.